The Studio exhibition, Robertson Art 3 was held in October 2005. Over 500 people attending the Opening, which was officially opened by the Mayor of Vincent Nick Catania. This exhibition was the third by the studio at Robertson Park. The exhibition explored images and ideas associated with the shared spaces of the studio and the surrounding park. PHOTO (left to right): Artists Rear: Diokno Pasilan, Graham Hay, Umberto Alfaro. Front: Carol Rowling, Susanne Hamlin-Sullivan. 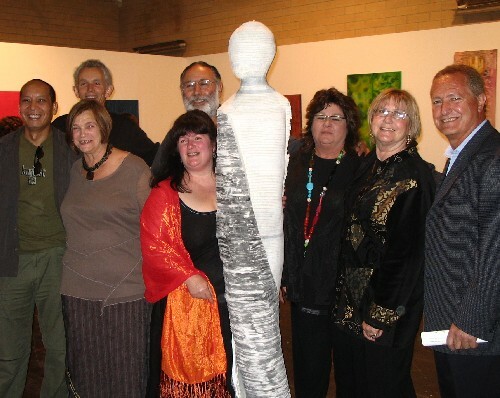 Artwork by Graham Hay, Rosie Reeman from Corporate Sponsor Masterplanners Interiors Pty Ltd, artist Frances Dennis and Mayor of Vincent Nick Catania, at the exhibition Opening. The major Sponsor was Kotai Estate Boutique Wines.